PandaTip: PandaTip: This section allows you to introduce yourself to your clients and highlight what makes you and/or your company special. Be specific about your accomplishments, but don’t go overboard. This should be a couple of quick paragraphs. In a world with more than 3 billion active email addresses, it’s no secret that many of us prefer digital communication. Sometimes we check our inboxes on a smartphone or tablet, and other times we use a desktop or laptop. But no matter which way you like to read, it’s all about the content. [Sender.Company] is a proven leader in email marketing. We have an average email open rate of 40% across our large client base, which is nearly double the industry standard. We’ve worked with everyone from small businesses hoping to become big names in retail to Fortune 500 companies looking for a fresh approach to consumer outreach. We understand the power of communication and look forward to introducing you to a whole new set of customers. PandaTip: What you’ll see here is a generic email marketing process, but you should tailor this section specifically for each client. It’s important to be clear and upfront so your clients have an understanding of how you and your team will execute their email marketing campaign. Be specific but concise; again, don’t drone on and give too much info. You don’t want to bore your prospects. You’ve already made the smart decision to pursue a new email marketing campaign, so we want to make sure your expectations are met and you’re satisfied with the end result. Here we begin laying out the process to eliminate any surprises down the road. Step 1: One of the first things [Sender.Company] will do is analyze your customer base to determine how to craft messages that resonate with your audience. If you already have existing email subscribers, we will focus on how and why they signed up in the first place. How often do they open emails from your company, and what do they want to see in those emails? If you do not have an existing subscriber list, we will determine the best way to highlight your business and get the word out about what you offer. Step 2: We want to make sure your best work is finding your customers’ inboxes, and we also want to keep giving those customers information that is valuable to them so they remain customers — and possibly even help recruit others. This means understanding your business as well as you do. We will hold meetings with relevant employees and/or departments in your company to make sure you’re sharing important things with your email subscribers. Step 3: Now that we know who your email subscribers are, what makes your company unique, and what you want to communicate with your customers, we are ready to craft email marketing material. While we take complete control of crafting your messages, nothing is dispatched until you’re satisfied with the content. PandaTip: Following on the “Research & Planning” section, here you can explain how exactly you will achieve the best email marketing campaign for your clients. Some clients might know the process, but others may not. Simple and straightforward here will get you the best results. Your customers are the most important people you deal with on a daily basis, so make sure they know you care. If you’ve got something new to show the world, do it first through your email subscribers. [Sender.Company] shines in this light, as our writers produce clean and concise copy, giving readers just what they need to take the next step and follow links in your emails. And our designers know the most effective ways to use art and copy to draw in readers. PandaTip: Tailor this to your needs. You know better than anyone how you and/or your team works. As the saying goes, too much of a good thing can be bad. 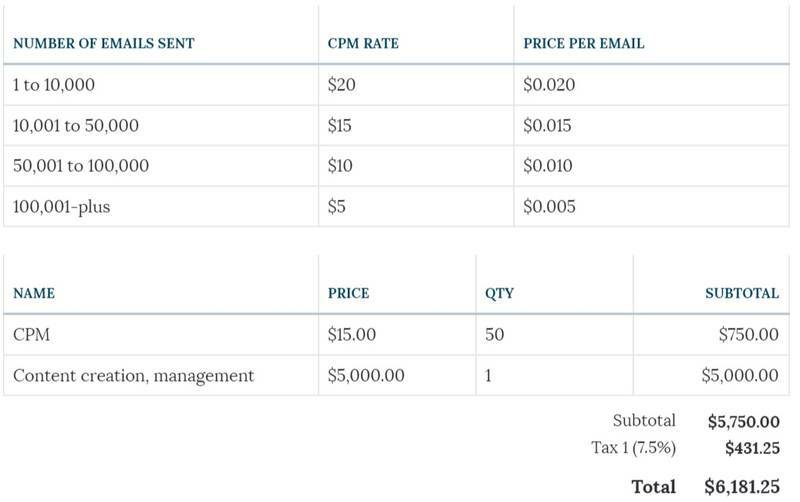 [Sender.Company] will determine how often to send email blasts based on your business model and email open rate. We will also schedule everything to be sent at previously agreed upon times so you’re never caught off-guard or something is dispatched in a dead period, such as a holiday weekend. We also want to make sure you’re getting your money’s worth, so we will create a set of goals with you so you can see the value in effective email marketing. These goals will include the open rate on emails and changes in online traffic after emails are sent. We will compile monthly reports for you to review. PandaTip: These are general guidelines and should be tailored to how you’ve billed previous clients. *Payments must be issued to [Sender.Company] on the 1st of each month.